I need to address something concerning repeat issues with work I have taken in. I have been patient and tolerating it, but for my own health, I cannot tolerate it anymore. The below policies will apply to all customers requesting services. Stacey Sansom Designs is a smoke-free and pet-free working and living space. Please be respectful of this. All items MUST be washed and clean. No exceptions. All garments MUST be washed or dry-cleaned before bringing them to Stacey Sansom Designs for alterations, repairs, or to have patches sewn on. This is a sanitary issue. No exceptions. There will be an additional $35 handling fee attached to all unwashed clothing items. This is a washing and maintenance fee. All drapes MUST be washed or dry-cleaned before bring them to Stacey Sansom Designs. If your drapes have been hanging and have not been laundered for weeks, months (or years), please launder or dry clean beforehand. There will be a $25 handling fee attached to each dusty or dirty drapery panels. That is $25 per panel. This is to cover the cost of equipment cleaning and maintenance after your project is complete. Dust and grime gunks up the sewing machine and all items will be washed or dry-cleaned before services are rendered. You will incur the above associated fees. There is no excuse for lack of time to get it taken care of. Your time is no more valuable than mine. Be considerate and wash your items before bringing them. All garments MUST be clean of all animal hair. No exceptions. There will be an additional $35 handling fee attached to all unwashed clothing items. This is a washing and maintenance fee. All drapes MUST be clean of all animal hair. No exceptions. There will be a $25 handling fee attached to each dusty or dirty drapery panels. That is $25 per panel. This is to cover the cost of equipment cleaning and maintenance after your project is complete. Please wash or dry clean and immediately put into a zippered bag if you have pets. If you are having patches sewn on, please put the patches in the bag with the item. Dust and grime gunks up the sewing machine and all items will be washed or dry-cleaned before services are rendered. You will incur the above fee. There is no excuse for lack of time to get it taken care of. Your time is no more valuable than mine. Be considerate and wash your items before bringing them. All items MUST be clean of smoke. No exceptions. It makes no difference what kind of smoke it is. Cigarette. Fireplace. Campfire. Cheap candles. Raging wildfires. No exceptions. Please wash and immediately put into a zippered bag if you or a family member smokes. If you are having patches sewn on, please put patches in the bag with the item. 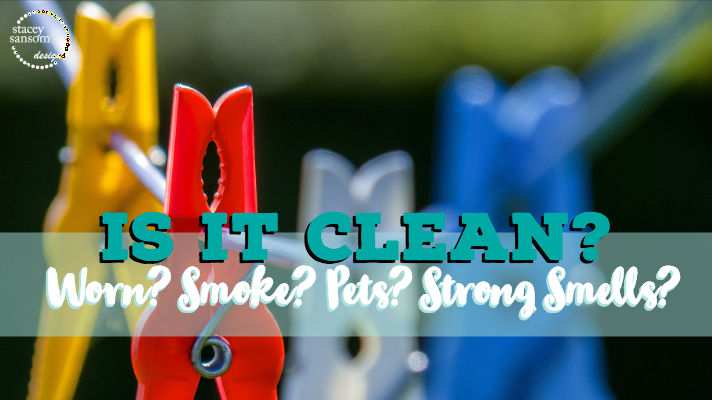 All items MUST be clean of strong smells/odors. No exceptions. All garments MUST be clean of strong smells/odors. No exceptions. There will be an additional $35 handling fee attached to all unwashed clothing items. This is a washing and maintenance fee. All drapes MUST be clean of strong smells/odors. No exceptions. There will be a $25 handling fee attached to each dusty or dirty drapery panels. That is $25 per panel. This is to cover the cost of equipment cleaning and maintenance after your project is complete. These items are migraine triggers and we have multiple individuals in our family who suffer from migraines. Please be respectful. If I have a migraine, I cannot complete your service request in a timely manner. Please wash and immediately put into a zippered bag if you enjoy any of the above items. If you are having patches sewn on, please put patches in the bag with the item. Thank you for being understanding in this matter.